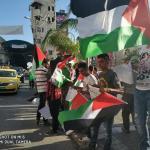 Since weeks, Palestinians from all walks of life throughout the West Bank are staging protests to pressure the Palestinian Authority to comply with its duty towards the people in Gaza and to end unblock the salaries for the public service in Gaza and to start payments for the energy bills again. While the central protests in Ramallah continue, protests are spreading to other cities as well. The vocal and determined protest in Tulkarem had been preceded by a similar event in Ramallah. More protest are being planned until the people's demands are met.